Event now closed--thank you for joining us! See you in 2019! 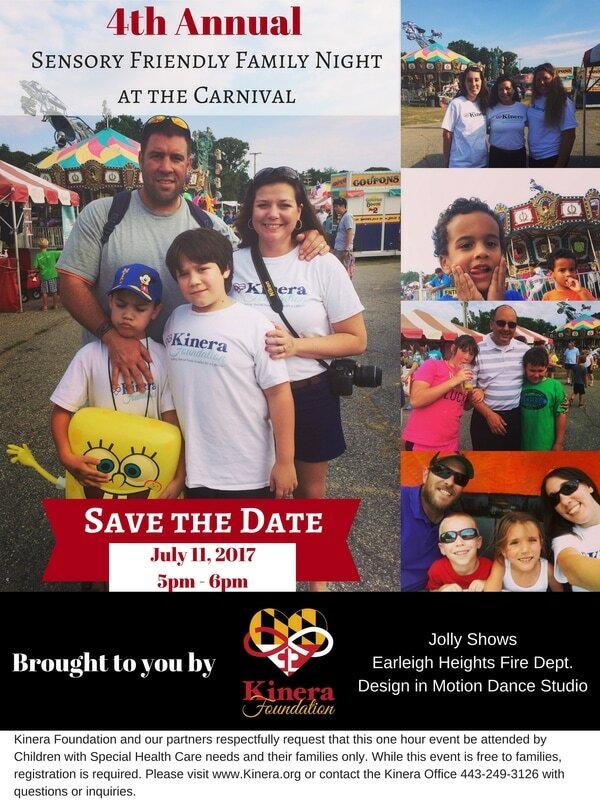 ​Please join us on Tuesday, July 11 from 5pm to 6pm for Kinera's annual sensory friendly family carnival night at Earleigh Heights Volunteer Fire Company. This event is free-admission for families with children with special needs; siblings are welcome! The Jolly Shows carnival at Earleigh Heights Volunteer Fire Company will open an hour early at 5pm with toned-down lights and sounds to make a more comfortable environment for children and their families. ​Please note: not all carnival rides are open at 5pm; food, drinks and games are not included in the free admission.